The Celebration is the first entry in the Danish film movement, Dogma 95. 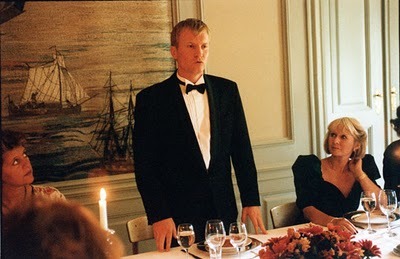 Film-makers Lars von Trier and Thomas Vinterberg crafted the Dogme Manifesto (or “Vow of Chastity”) in an effort to “cleanse cinema of an obsessive concern for technique” and “rehabilitate a cinema which foregrounded the story [and] the inner life of its characters” (Hjort). They rejected the “superficiality and ‘trickery’” of mainstream film-making. Films made according to the Dogma principles, like The Celebration, typically have a rough, raw, gritty quality; far removed from the “slick artifice and technical virtuosity of [Hollywood]” (Hjort). In his dissection of the Danish film-making collective, Jean-Pierre Geuens wrote that “if you change the way a film is conceived and shot, you alter its very core, the kind of film it is… If you give up the traditional tools of filmmaking, the entire conventional edifice eventually collapses” (Geuens). This essay will examine how applicable this argument is to The Celebration; how Vinterberg has used and subverted conventional narrative and character motivation. It will also explore the visual style and film-making technique Vinterberg has employed, through the lens of the Dogma initiative. The Celebration is an exploration of several confronting issues, including child and spousal abuse; revenge; racism; and, in the process, shows how difficult it can be to differentiate between love and hate, when the lines between them become blurred (Hoberman). Vinterberg addresses a very twisted family dynamic, combining uncomfortable melodrama with an undercurrent of dark humour. The film depicts a wide range of troubled characters. First and foremost is Christian, the passive eldest son. Portrayed with a quiet intensity, he has a haunted but determined look in his eyes. Christian doesn’t seem like the kind of man who seeks a confrontation, but the memory of being molested as a child appears to be “a struggle he can no longer suffer in silence” (Hoberman). Christian’s polar opposite is his younger brother Michael, who is presented as “a thoughtless, vicious brute” who “terrorises his wife [and] anyone else who doesn’t agree with him”. It is unclear how deeply the events that moulded Christian's life affected Michael's development, but there is clearly a link (Ebert). The third child, Helene, is “a portrait of camouflaged sadness”, still upset over the recent suicide of her older sister (Michael’s twin). The other major character, Helge, the patriarch of the family, is something of an enigma (Hoberman). Seemingly a kind father and respected gentleman, he is revealed to have committed horrific crimes against his own children, and yet his humiliation by the final scene is so complete that the audience is almost made to feel sorry for him (Hoberman). Indeed, every character is depicted as flawed, troubled, and yet ultimately sympathetic. The subject of child abuse remains a very challenging matter for a movie, and the setting chosen by Vinterberg is one of the most provocative. The family reunion is a very relatable event, and the audience are able to recognize patterns, while at the same time, the very formal atmosphere “creates a stage for Christian’s revelation” (MacKenzie). This echoes TV shows such as Rikki Lake and Jerry Springer, in which “a live audience decides what’s right and wrong” and the “victim” is given advice in making their decision (Guthmann). The good patriarch, the cheerful mother, the senile grandparents and the four typical children are people we’ve met before. Any viewer can recognise such personality types. They are very representative of any family, in any class of the society, and since they are very stereotyped, “they are easy to relate to and to recognize” (MacKenzie). Vinterberg also uses the conventional break between the good servants, living downstairs and the masters, “keeper of the appearances”. Part of the house for such a long time, the servants know the truth and will help the protagonist to succeed. Here Kim, the cook, who provokes a meeting between Christian and his father after the first speech, organises from downstairs the hiding of guest’s keys and prevents any taxis from reaching the manor (Hjort). Pia (forever in love with Christian) gives Linda’s letter to Christian, which is the final step for the truth to be revealed. Besides the privileged extended family and their servants, there is Gba-tokai, Helene’s African-American boyfriend. Gba-tokai may serve as a surrogate for the English-speaking audience, as he does not speak a word of Danish, but is able to “feel” what is going on. The family's reaction towards him is “a very cheap denunciation of racism... totally out of the plot and the only secondary story which does [not] find a logical resolution”. He may also symbolise the new progressive, multi-cultural world (which Christian and Helene have embraced), confronting the old generation, in all their grotesque hypocrisy (Hjort). Making use of such stereotypes and many others allows the viewer to feel connected to the film; to be part of it because they can easily recognise such patterns from real life and from their own cultural background (Hjort). Another narrative convention Vinterberg plays off is the idea of the “fairy tale”. The “out of the world universe”, the “upstairs-downstairs division” but most of all, Christian asking Pia to join him in Paris gives us the feeling we are watching a fairy tale (Guthmann). The “noble blonde hero” has “eradicated the evil king, helped by the beautiful princess who was locked in the castle”, and the newly-formed couple will, for sure, live happily ever after (Guthmann). Christian could also be seen as a lonely, Clint Eastwood-type crusader, coming to make justice in this outside world (Hoberman) Such a narrative cues seems at odds with the Dogmatic principles of staunch realism, though Vinterberg may also be using Hollywood clichés to emphasis the inherent horror of the situation. One of the key elements of The Celebration is the style in which it is presented. It was filmed using a shaky, hand-held camera with natural lighting and little or no post-production, other than to transfer the video image to a 35 mm negative (Ebert). Vinterberg’s approach mimics the look of a TV mockumentary (such as The Office) or a reality TV show (such as Big Brother). The effect is to “make the viewer feel like he or she is part of the action”; “an impotent observer seated [at] the table with all of these individuals” (Hoberman). It is a somewhat unnerving experience, as the characters become real to us. Their actions take on an importance they would not if the circumstances seemed less intimate (Hoberman). The Celebration was shot with one of the smallest digital video camera available, a Sony PC7, which fits in the palm of a hand (Ebert). This produces a rather blotchy, grainy image when transferred to 35-millimeter. Vinterberg frames and edits it with “such eccentric [yet] logical abandon” (Ebert) He cuts suddenly to overhead shots, crosscutting between as many as three simultaneously unfolding scenes and jump-cutting at regular intervals. He “counteracts the continuity of the plot with as much discontinuity as possible” without losing the threads of the action (Ebert). The aesthetic of the film is like a horror mockumentary version (think Blair Witch Project) of a well-constructed three-act play. Vinterberg is able to depict a finely crafted narrative with an illusion of randomness and a sense of urgency that considerably heightens the reality of the film. The use of natural light only works in the film favour by helping convey an atmosphere required by each scene. The film starts off in daylight as all the family members arrive at the family run hotel to celebrate their father's sixtieth birthday. The bright sunlight is therefore “good... to convey the idea that the family is actually attending what they believe will be a celebration” (Guthmann). However, as the story unfolds and dark secrets of the family are unravelled, the light also changes. Outside shots “give way to darker interior shots”. Sharp images shot in daylight “give way to darker and grainy images” (Guthmann). The use of handheld camera, however, is perhaps the most important element in conveying the general atmosphere of the film. The constant trembling and sharp movements of the camera in “closed claustrophobic environments” create the uneasy feeling that there is “something constantly threatening to explode” (Simons 50). When the secrets in The Celebration are eventually revealed, unleashing anger and hatred, the explosive moments the viewers had anticipated come to fruition. The fast camera movements only serve to enhance the violence of each scene (Simons 52). Vinterberg uses flat-focus digital cameras, revolving primarily around “the grid of medium shots” and “a subversive obsession with the close-up” (Simons). The illusion of reality is emphasised even more through the use of video. In any other film, “it would have created a distance between the audience and the film” and “given off a feeling of ‘avant-garde’”, because the image is not the one we are used to on a large screen (Simons). Here, however, Vinterberg chose to film a family reunion with a cheap video camera. In such a context, the grainy, shaky pictures remind the viewer of the “home movies” they’ve been made to watch. Vinterberg plays a lot with amateur gimmicks, such as zooming in and out (For example, when Helge is looking for Christian) or the abusing of rapid, unskilful camera movements. When the guests gather in the hall, it’s as if a hyperactive five-year old is in charge of the image (Simons). Dogma 95 was an attempt to return to “cinematic innocence and simplicity”. It was an attempt to make a fiction film carried by actors, but with a minimalist aesthetic. This means that there “should not be any technical contingencies interrupting the actors’ interpretation” on the set (MacKenzie). The camera should just be there to record their performances and subordinate itself to them. Through editing, “manipulation of image and sound is then totally forbidden”. The film should be what happened on the set and nothing else (MacKenzie). The Celebration, like the movement that spawned it, is an artistic rejection of Hollywood's fascination with special effects. Vinterberg employs stark cinematic simplicity, including hand-held cameras, natural sound and lighting, location-filming only (which means no sets), and no computer manipulation of images. The result is a taught, shocking narrative that is made uncomfortably real by the primitive technology through which it is experienced.